Statistics tend to run from 1984 because that’s when a column started to appear on all official forms, asking whether or not a person believes in the ‘finality of the prophet;’ part of dictator Zia ul Haq’s ’Islamization’ drive that cordoned off Ahmadis and other minorities from mainstream life. But recently things have become markedly worse, with at least eight Ahmadis murdered in the last year alone in Pakistan, according to the Asian Human Rights Commission (AHRC), and many more falsely arrested. Doctors are a popular target, possibly because Ahmadis tend to be well educated (the group claims a 100 percent literacy rate for women) and at least seven have been murdered in the last three years. 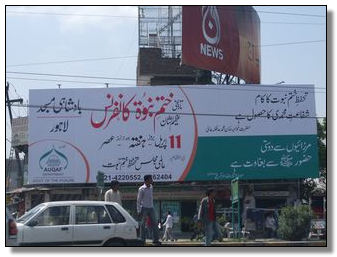 In 2008 and 2009 a spate of vociferously anti-Ahmadi conferences (known as the Khatme-E-Nabwat movement) have gone ahead in Punjab, with street processions and two-storey billboards in town centres proclaiming ‘Friendship with Mirza (Ahmadis) is like the enmity of Allah’ (see image). One of the official sponsors in a number of these events was the Pakistan Muslim League (PML-N), the provincial ruling party; their insignia appears on the billboards and members of parliament attend. Ahmadi groups also point out that frontline PML-N politicians — including current Chairman Raja Zafura-ul-Haq and Pakistan’s former president Rafiq Tarir have belonged to aggressively anti-Ahmadi parties such as Jamaat Islamiah. For sect members in this province in particular, these conferences are a time to keep their heads down. In fact the law for Ahmadis appears to be working inversely, blasphemy laws in particular being misused — it is estimated by the AHRC that 500 Ahmadis are currently charged with offences that vary from ‘impersonating a Muslim’ to desecrating the Quran, which is punishable with death, and in most cases little evidence is used to book them. “People are very loyal and lovely,” insists Munawar Ali Shahid, the General Secretary for Amnesty International in Lahore, an Ahmadi. “The problem is the politicians and political parties and their underground alliances with religious groups.” Nevertheless he talks of discrimination against his son at school — he was told not to drink from the same tap as other students by his teacher — and of reluctance to tell people of his religion.